The Richmond community has started 2006 with more vigils and memorials than anyone would like to see -- Tuesday and Wednesday night, there were vigils for Bryan, Kathryn, Stella and Ruby Harvey, who were brutally slain in their South Richmond home on New Year's Day; yesterday afternoon, there was a memorial service for four-year-old Ruby at her daycare; last night, a vigil for a father and daughter killed a few miles from the Harvey's in a seperate murder. Tonight, a significant spoke in the Harvey's circle of friends will have an informal opportunity to connect at Richmond's First Friday Art Walk. The weather is expected to be cold, and I imagine the mood will be subdued. On Saturday, expect the Byrd Theatre to be filled past overflowing for a memorial service honoring the memories of the Harvey family, who were a creative, entreprenurial and spirited anchor in the Carytown community. 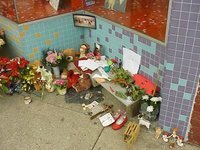 Terry Rea posted a few pictures today on SLANTblog of the expanding tribute of flowers, candles, toys and notes that have been left outside of Kathryn's store, World of Mirth. Among others, the service attracted children, accompanied by their parents, from the church's child-care center, which Ruby attended, and from Fox Elementary School, where Stella was in third grade. The staff of the child-care center attended as a group. Sparks recalled a long-ago seminar he attended on the Holocaust. Someone asked where God was when the death camps worked and the furnaces roared. The answer then was: "He was in the furnaces," he said. "Where was God, where was Jesus, in all this?" Sparks asked about the Harvey slayings, in a way that would not upset the younger chil- dren in the sanctuary. "There is only one answer to that. He was in the basement." "Jesus is weeping for us and for all children. . . . Jesus loves us," Sparks said. "Never believe otherwise." For the children, the service included a short story read aloud about water bugs living on the bottom of a pond that wondered why their friends that climbed up a water-lily stalk never came back. One bug that climbed the stalk promised to come back to explain what he found up there. But at the top of the stalk, he found a lily pad where he helplessly collapsed and was changed into a dragonfly. He found he could fly all around and do wonderful things, but he could never go back to his friends under the water and tell them what awaited. He realized he would have to wait until they climbed the stalk themselves and discovered the new life. The Times-Dispatch also has an online slideshow of photos from Wednesday night's vigil outside of the Harvey's home. More than 250 people -- friends and strangers alike -- have posted memories and thoughts of the Harvey's on the TD's online memorial page. Rob at Jalpuna has posted his reaction and a tribute to House of Freaks. Bluecricket.com is home to an old tribute site to the House of Freaks. The site's creator has posted a number of times this week with his thoughts and links to other sites.